This is actually the second book in a trilogy written by Jennifer Worth, recounting her time as a nurse/midwife in 1950s London. I read the first book, originally titled, simply, The Midwife, several years ago – back before the PBS television series Call the Midwife was born (which I still have never seen, as I’m not much of a television watcher). I don’t know if the title of the book was changed after the TV series became a hit, or before, but it is now titled Call the Midwife: A Memoir of Birth, Joy, and Hard Times . 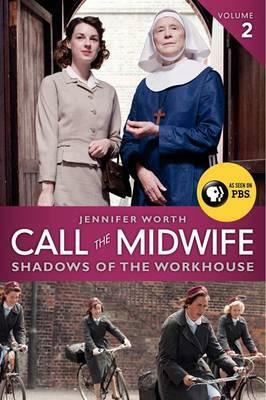 I discovered a long time ago that Jennifer Worth (who died in 2011, apparently) had written two follow-up books to her original memoir, The Midwife, but they went out of print before I could ever get my hands on them, and it was only recently that I realized that they are available, just under the new title, Call the Midwife. I couldn’t wait to dig into this second book once I discovered it, remembering how much I loved Worth’s first book, and expecting more wonderful birth stories, being the birth-story junkie that I am. However, Shadows of the Workhouse does not contain a single birth story. Rather than focusing on her career as a midwife (which, as it turns out, was relatively short-lived; I was disappointed to learn that midwifery was not her “calling,” but rather something she tried her hand at for a few short years. Her true passion, apparently, was music, and eventually, she left midwifery and nursing to study music), this book recounts the lives of several people with whom Worth became acquainted with during her time working in London’s East End who had grown up in workhouses. These are stories of almost unimaginable suffering, but also resilience and love and the strength of the human spirit. My disappointment at the absence of more stories of birth was quickly replaced by an appreciation for Worth’s gift for recounting all sorts of harrowing stories and moving the reader deeply. I have no idea how much the PBS series follows Worth’s books, but whether you’re a fan of the TV show or not, I really recommend the books. I have the third book in the series and will be reading it shortly.